Advanced Skincare For All Skin Types From Nataliya Robinson, The Skin Whisperer. High-performing botanicals combine with cutting-edge technology, to treat a variety of modern skin complaints. Treatments offered from the women’s only clinic in the heart of Chelsea. Beeswax, Sweet Almond Oil, Shea Butter and natural lanolin (cruelty free!) combine in this nourishing lip balm, which leaves lips soft and replenished. 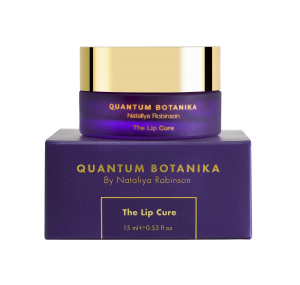 The Lip Cure is free from petroleum, chemicals and an extremely natural product. Safe and responsible manufacture. Free from nano-particals. No chemical ingredients of synthetic origin. 100% natural origin. Proudly British. My Balancing Cream . Moisturiser. All skin types. 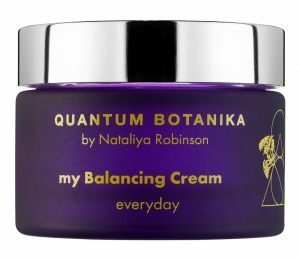 Based on a cream that Nataliya created to balance her own break out-prone skin, this gentle cream is ideal as an everyday moisturiser for dry, oily or sensitive complexion. Natural Lanolin is the key ingredient, which provides intense moisturisation; whilst calming aloe vera and soothing Vitamin E are rich sources of antioxidants and vitamins which aid in the natural healing process of the skin. It is free from artificial colours and fragrances. If you would like to personalise your skin care plan please set up a call directly with Nataliya Robinson 07774 544455. 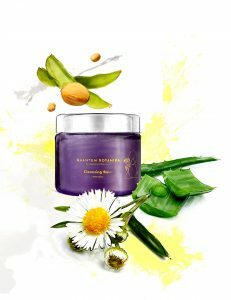 Cleansing Balm. All skin types. Vegan. 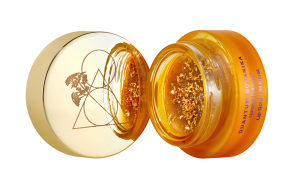 This super-rich balm wipes away daily grime and makeup, leaving a layer of protective oils in its wake. The skin feels soothed and strengthened, never stripped. Skin feels plump, soft and happy once more. Suitable for VEGAN ! The WATERLESS formulation. Suitable for all skin types and conditions. This cleanser is a must-have and the cornerstone of your facial skincare regime. It was designed to reboot your skin and provide it with gentle yet effective cleansing. Incorrect cleansing methods can lead to premature ageing of the skin. This silky, lightweight gel is a modern way to hydrate. A blend of organic Bulgarian Rose oil, Aloe Vera and Acmella Oleracea Extract, it sinks quickly into skin, leaving skin looking plump whilst helping smooth the appearance of fine lines. Shiitake Mushroom extract helps strengthen the skin’s immunity, while Hydrolysed Silk helps provide the skin with amino-acids. Suitable for all skin types and conditions. 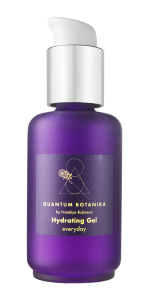 The Hydrating Gel is a must-have in your daily skincare regime. Herbal Water. Facial Toner. Vegan. This balancing toner helps refresh and revives tired complexions. 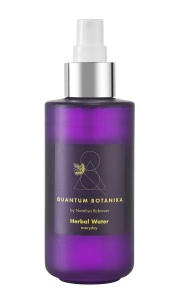 A distillation of thermal water and essential oils of sage, rosemary and calendula extract, it helps calm inflammation and brings moisture to thirsty skin. Suitable for all skin types and conditions. Especially good for those who do not use very many skincare products. Spot Solution. Very effective. Vegan. This powerful spot solution is high in active ingredients, which helps diminish spots and active acne. Inflammation is reduced and breakouts are improved, quickly. “Nataliya Robinson is a whiz with skin. If you have a skin issue, she’ll sort it. So hooray for her skincare line. 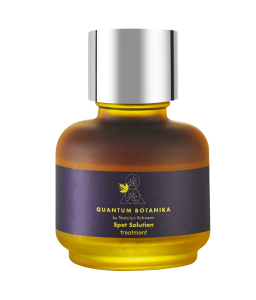 This spot treatment is filled with active ingredients, which reduce inflammation. This is particularly good on hormonal spots that pop up once a month”. Clarifying Serum. All skin types. Vegan. Winner – “The TATLER Beauty Awards 2018” This resurfacing treatment works gently to help clear the complexion. A combination of Lactic acid, Sugar cane and Citrus extracts brightens dullness and pigmentation, whilst Witch-Hazel helps prevent breakouts. Skin looks polished, even-toned and glows with health. Suitable for dull, oily, congested, unbalanced, dry, dehydrated, hormonal, and lacklustre skin. 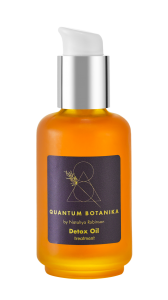 Beauty Detox Oil/Dry and dehydrated skin. Vegan. This supercharged oil is packed with antioxidants high on the ORAC (Oxygen Radical Absorbance Capacity) scale to help boost skin cell function and immunity. 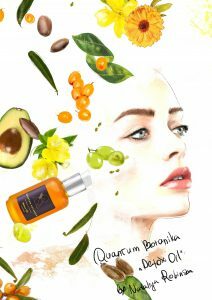 Argan, Avocado and Vitamin E oils nourish, whilst omega-rich Sea Buckthorn helps keep skin feeling supple and energised, the Tri-peptides help soften the look of fine lines. The complexion is healthy, inside and out. The Detox Oil has a very light non greasy texture. Dry, dehydrated, sensitive, or mixed skin types. On problem areas with active acne breakouts use only as a treatment for 45 minutes and wipe off. 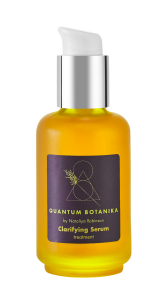 In Quantum Botanika, the first line of skincare by acclaimed facialist and acupuncturist Nataliya Robinson. Nataliya’s own hand-blended formulations, created especially for her clients, were the inspiration for a range that would address modern skin complaints, from sensitivity to congestion. 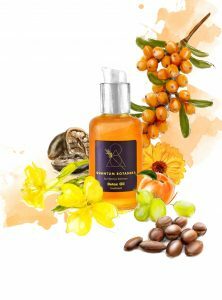 High-performing botanicals combine with her extensive experience of perfecting the skin – and the result? Beautiful, multi-purpose products that clean, treat and soothe. Nothing more, nothing less. Inside, you’ll find ingredients prized for their anti-oxidant properties, to help fight inflammation caused by urban stressors such as pollution and digital devices. 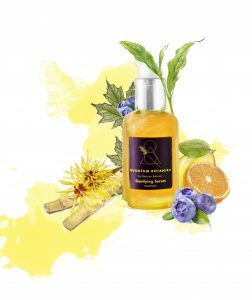 Essential oils strengthen the skin’s lipid barrier, whilst nurturing the natural microflora. The skin is calmed and protected – equilibrium is restored.